Peterborough Telegraph ice hockey writer Mark Plummer takes a look at what Peterborough Phantoms are up against this season . . .
Rink: Planet Ice. Last season: 3rd. Coach: Doug Sheppard. Top import: Bison have opted for an overseas netminder - Tomas Hiadlovsky – and we know how good they can be . . .
Top Brit: Joe Greener is a tough customer. Physical and increasingly prolific forward with a half-century of points in six of the last seven EPL season. 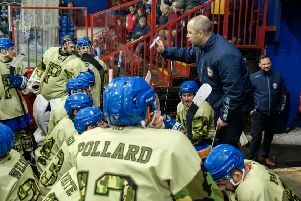 Prospects: Three things are pretty much guaranteed – Basingstoke will be niggly, they will be confrontational and they will be closer to the top of the table than the bottom. Rink: The Hive. Last season: 9th (bottom). Player-coach: Lukas Smital. Top import: Frankie Bakrlik was rumoured to be a Phantoms target until opting to move to Bracknell – 255pts in three seasons make the burly Czech a top man at this level. Top Brit: Persuading classy defenceman David Savage to leave Guildford after a decade will be a smart move. Prospects: Cast adrift at the bottom last term but investment from Telford owners Red Hockey has enabled them to assemble a more competitive roster for 2015/16. Will expect to leave the basement behind and should challenge for a play-off spot. Rink: The Spectrum. Last season: 2nd. Player-coach: Paul Dixon. Top import: Slovakian Erik Piatak piled up 75 points in a struggling Phantoms side two years ago. He could be good value for even more for Flames. Top Brit: Big defenceman Rupert Quiney was surplus to requirements at Telford. He’ll play a much bigger role for Guildford. Prospects: Dixon has won 13 trophies during a 17-year career as player and coach with Flames, combining both roles for the past eight years. He has rung the changes to keep them competitive and they’re likely to be at the forefront of the teams chasing Telford. Rink: Hull Arena. Last season: N/A. Player-coach: Dominic Osman. Top import: Experienced Czech defenceman Jan Platil will need to be good. Top Brit: Forward Osman boasts North American, Australian and Elite League experience. He will need to star on the ice as well as off it. Prospects: The Pirates were late to the EPL party after only being formed in June to replace the defunct top-flight Hull Stringrays club. Osman was rapidly recruited from Sheffield Steeldogs (a club also owned by Pirates chief Shane Smith) and has worked hard to draft in a mix of experience and unknown quantities. Will surely struggle . . .
Rink: Deeside Leisure Centre. Last season: 6th. Coach: Tony Hand. Top import: Slovakian Stanislav Gron looks the pick of a trio of new overseas forwards. Top Brit: GB international Luke Boothroyd will be back to his best after missing half of last season injured. Prospects: Phantoms denied the legendary Hand a glorious swansong to his playing career in the play-off final at the end of last season. Now confined to the bench, his Pheonix side are far from certain to be back in Coventry this time around. Playing a temporary base almost an hour from Manchester won’t help. Rink: The Arena. Last season: 7th. Coach: Pete Russell. Top import: 203pts in three Elite League seasons at Edinburgh mark Slovakian forward Rene Jarolin down as a man to be watched in the second tier. Top Brit: New netminder Dean Skinns has been operating in the EPL for a decade. He can be one of the best. Prospects: The arrival of GB head coach Russell has been followed by an influx of new players. Experienced improvements and some very promising Bris should ensure they are upwardly mobile. Rink: Planet Ice. Last season: 4th. Coach: Slava Koulikov. Top import: Janis Auzins is the finest netminder at this level. Top Brit: Tom Norton will be a key figure in an all-homegrown defensive corps. Prospects: Debate remains as to whether Phantoms over-achieved or were under-estimated last season. If it was the former, they’ll need to find further improvement in 2015/16 because there is no chance of the latter happening again. Should safely find their way into the play-offs at the very least. Rink: IceSheffield. Last season: 8th. Player-coach: Greg Wood. Top import: Lithuanian international forward Arnoldas Bosas is a new face who arrives with a decent reputation. Top Brit: Ben Morgan is as good a defenceman as you’ll find at this level. Prospects: A summer of change saw player-coach Andre Payette axed and Dominic Osman drafted in. Osman built the Steeldogs roster before then departing for newcomers Hull and leaving Wood to take over. Difficult to envisage them making much progress. Rink: Link Centre. Last season: 5th. Player-coach: Stevie Lyle. Top Brit: Aaron Nell – fine forward who’ll score for fun as usual. Prospects: Remains to be seen if a new boss (Lyle replaces Ryan Aldridge) can unlock further improvement in a side normally booked for a mid-table finish. A couple of solid defensive recruits certainly won’t do any harm. Rink: Telford Ice Rink. Last season: 1st. Coach: Tom Watkins. Top import: Slovakian forward Peter Szabo had an 89-point debut season. Top Brit: Jason Silverthorn dropped down to EPL level with a bang last season and should star again. Prospects: Don’t expect the reigning champions to be knocked off their perch at the top of the table. Anything less than title glory will be a failure. Mark Plummer’spredicted finisnhing order: 1 Telford; 2 Guildford; 3 Swindon; 4 Basingstoke; 5 Phantoms; 6 MK; 7 Manchester; 8 Bracknell; 9 Sheffield; 10 Hull.